Iowa and New Hampshire have the first presidential nominating contests, but there’s a key Republican primary fight going on in Texas: the money chase. Here’s a behind-the-scenes look at GOP donors and bundlers in high demand. While Iowa and New Hampshire have the first presidential nominating contests, there’s also a key Republican primary fight going on right now in Texas: the money chase. The ring-kissing is occurring in every metropolitan area in the state and in oil-rich Midland. And the efforts are worth it for the potential candidates. In 2012, Texas ranked only behind California in presidential campaign contributions. According to the Center for Responsive Politics, Texas delivered more than $1 million to six different candidates. Texas gave the most — $36 million — to Mitt Romney's primary and general election campaigns. But it’s a new era in Texas fundraising, now that GOP megadonors Bob Perry and Harold Simmons have passed away. There are so many millionaires and billionaires in Texas, though, that the hopefuls seeking to mine the state for cash have plenty of options. Here’s a look at 10 Texas GOP donors and 10 bundlers — super fundraisers — who are in high demand during the money chase. This list is based on interviews with two dozen state and national operatives, Federal Election Commission records and data compiled by the Center for Responsive Politics. 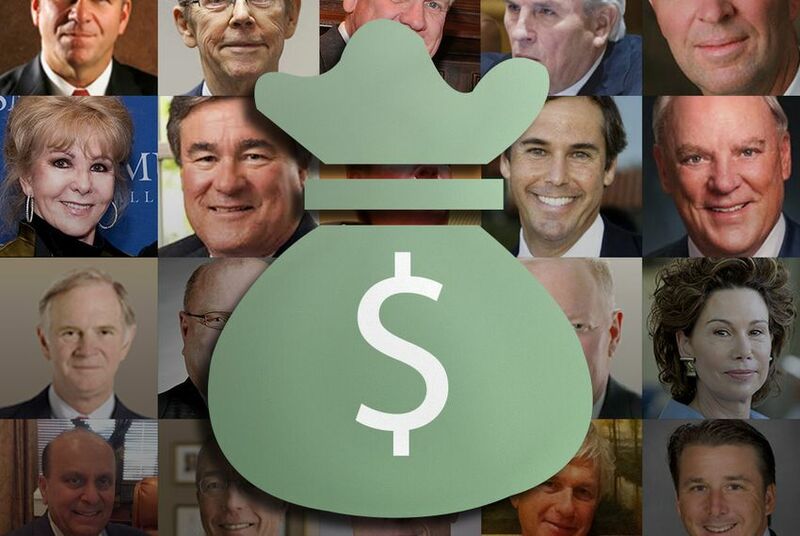 While dozens of influential Texas Republican donors and bundlers are not on this list, their impact could expand as the 2016 presidential race further takes shape. Few developments changed politics more radically than the introduction of super PACs in 2010. These outside groups, which are often aligned with but not allowed to coordinate with candidates, mean that Texas billionaires are no longer restricted in how much money they can spend to support a presidential contender. Texas, with its bounty of J.R. Ewing-level rich Republicans, have given generously to such efforts. Some money brokers don’t need to be super-rich to play at the presidential level. While limited in contribution size, bundled dollars are harder to round up. But some campaign operatives say they still put a premium on bundlers — the supporters who flip through Rolodexes and twist arms for direct campaign donations. Among the key benefits for bundled dollars: Federal candidates get a lower television advertising rate than super PACs, which means the dollars go further on the airwaves. To be sure, many of these supporters rank among the wealthiest people in the country and are as prolific in their giving as in their networking. Here’s a look at 10 key Texas GOP bundlers.